Update: The article updates are provided at the bottom of this article. 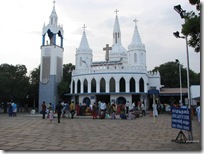 Also please see my travel report in November, 2012 here – Velankanni By Train. 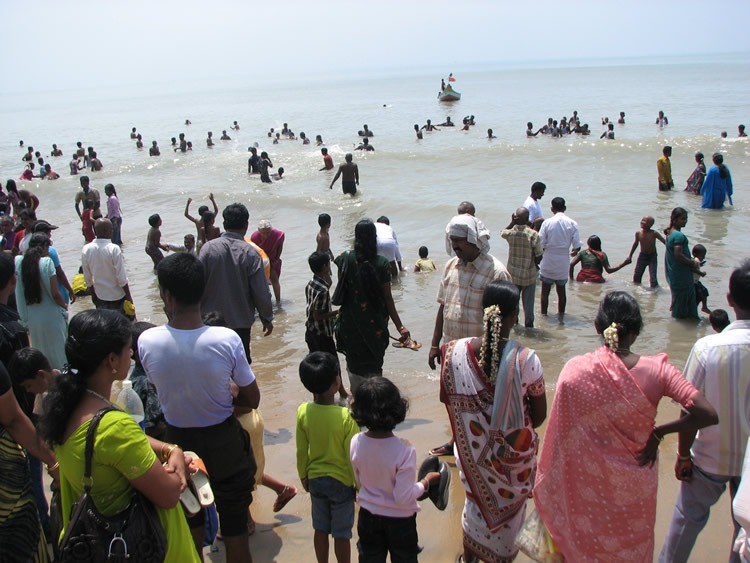 Velankanni is a coastal village in Nagapattinam district, Tamil Nadu. 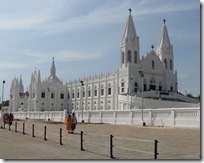 Even though it is commonly known as Velankanni, the correct spelling is Vailankanni. 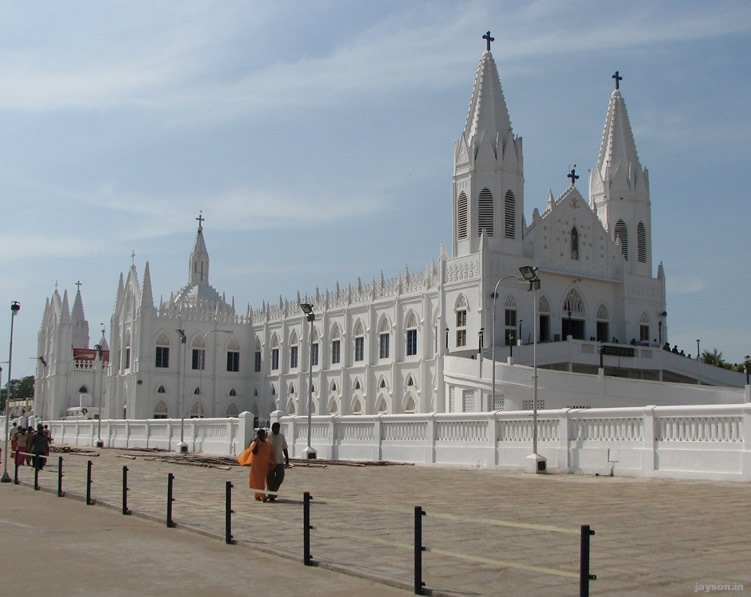 Velankanni is very famous for its Marian church known as "Shrine Basilica of Lady of Health". Thousands of people from all around India visit this place and hence is known as "Mecca of Christians" and "Lourdes of the East". There are a number of churches and other buildings in the Basilica complex and on one side it is flanked by Bay of Bengal sea. The annual church festival is from 29th August to 8th September. There is heavy rush during this period. It is interesting to note that majority of Velankanni pilgrims are from Kerala, especially from districts like Kottayam, Idukki and Thrissur. 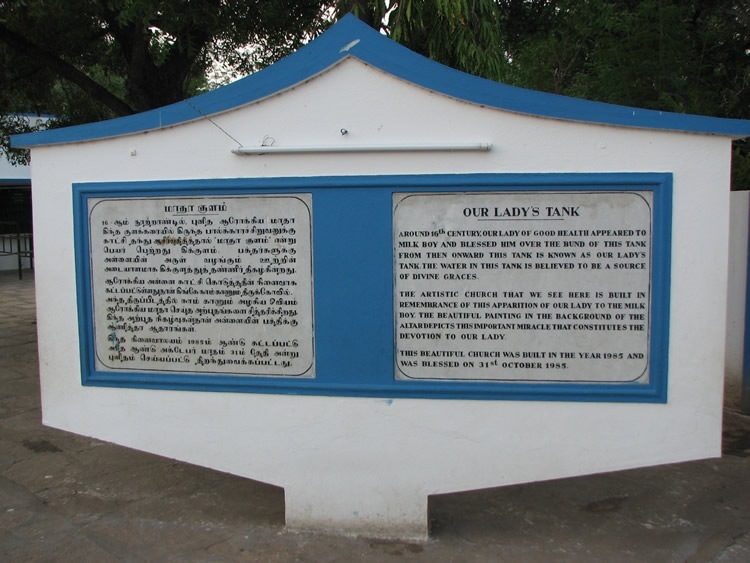 The history of Velankanni goes back as far as 16th century. According to legends, Mother Mary appeared twice to milk boys at the village during this period. There are churches on both these places (inside Basilica complex). In the first appearance, Mother Mary asked for milk from a boy. Boy gave milk to mother and later boy found that the milk pot is still full. This place is known as "Our Lady’s Tank". In the second appearance, Mother Mary cured a crippled boy. There is a small church at this place now. The third miracle happened sometime during seventeenth century and probably it was this miracle which caused rapid expansion of Velankanni church. A Portuguese ship going from Macao in China to Colombo was caught in a violent storm. The sailors prayed to Mother Mary for protection. It is said that the ship landed in Velankanni and as an offering sailors built a church at the seaside. In subsequent visits, Portuguese continued to build and expand the church complex. In 1962, Pope John XXIII granted Minor Basilica status to Velankanni church. The first bishop of Thanjavur, R.A. Sundaram was behind this decision. A new church extension modelled after the Lady of Lourdes was soon built. 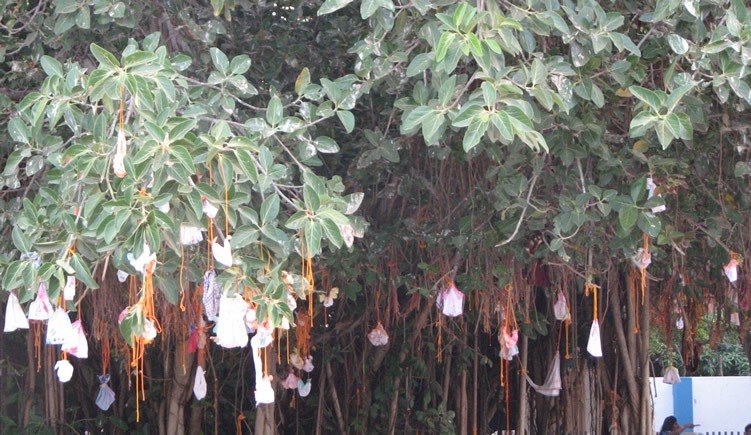 It is an Indian tradition to offer something to God in return for the favour of the God. And over time Christians in India has also customized it for their belief. It turns out that my wife had offered something to Velankanni Mother and I had no option but to take our entire family on a Velankanni trip. It was a good experience and I made most of it by taking a camera along with me! I stay in Trivandrum which is around 500KM from Velankanni. So going by car was ruled out (since I was the only driver). If you do plan to travel by car, ensure that you split the travel and stay somewhere like Thirunelveli or Madurai. I won’t recommend a direct drive. As you can see the Ananthapuri express reaches at a very odd time (2AM). We decided to take the Guruvayoor train which reaches in the afternoon. So the plan was to reach Velankanni by evening and stay there for the night and visit the church the next day. We reached Trichy at the scheduled time of 2PM. Take a direct bus from Trichy to Velankanni. Tiruvarur option is good since the train is at 4:30PM. Direct bus is the cheapest option, but you should take the bus from the first bus stand itself. Also the bus experience at 2PM is guaranteed to be a frying pan experience! We decided to take a direct taxi to Velankanni with the intention of retaining it for next two days and returning in it. Here we made a mistake. 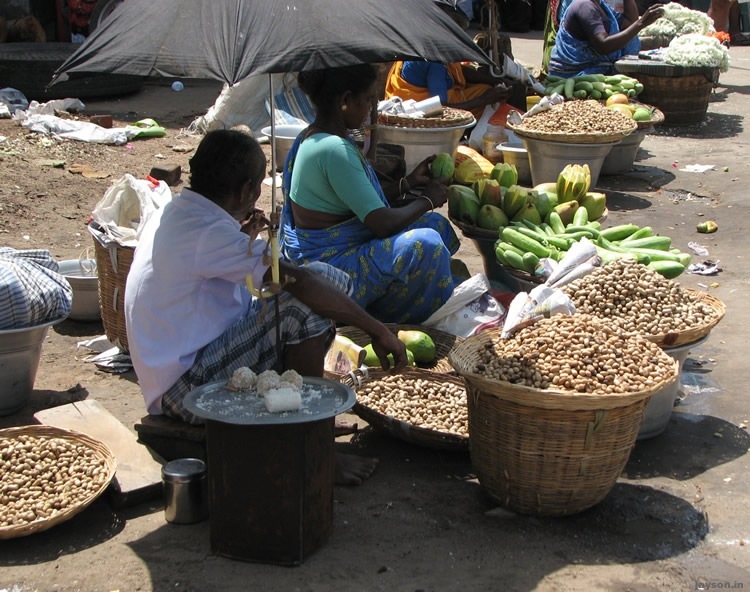 Instead of hiring a call taxi or a taxi from adjoining hotels in Trichy, we looked at the official taxi stand. All the ambassador taxis here are prehistoric and we soon realized that it is not for the faint hearted. We had a small bargaining with the taxi guy who sported a big moustache. He looked ferocious but had a heart of a child! 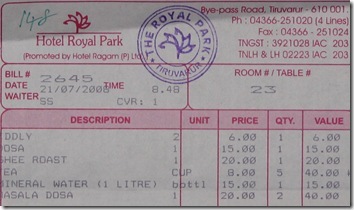 We ended up paying Rs. 3800 for two days stay at Velankanni and a total running distance of 330 Kilometres. He was decent and helpful, but at times very intrusive. We started from Trichy at around 3:30PM. The city traffic was thick, but we soon found ourselves on the NH67 which connects Trichy and Tanjavur. This highway stretch is being widened to a word class 4 lane highway by Madhucon constructions. This is scheduled for completion in the first quarter of 2009. Unlike highway expansion in Kerala, work in Tamil Nadu is progressing at an amazing speed. Once completed I think there won’t be any highway crossings! After a distance of about 15KMs, we started to hear a strange sound from the front left of the taxi. The taxi itself was a very old diesel ambassador with very low pick up(which will cause you to pull your hair out). I asked the driver whether there is any problem and he replied there is a known problem with some bush! After sometime the sound started increasing and I was increasingly getting concerned. Finally the taxi guy stopped at a roadside workshop and the workshop mechanic said it is a small problem and we can ignore the sound!! Trichy, Vallam(45km), Tanjavur(20km), Ammapettai(20km), Needamangalam(19km), Tiruvarur(20km), Nagapattinam(30km), Velankanni(12km). I recommend you take a break at Tanjavur or Tiruvarur. Gradually the sound from the car became so loud that even people on the roadside started to notice it. Suddenly a guy shouted at us to stop the car. We got out and saw that the front left tyre had almost got detached and it was on the last bolt! The problem all along was the loose tyre bolts! The driver frantically fixed it and we never had any problem during the rest of our journey. We could spot only one good restaurant on the highway named "The Royal Park" near Tiruvarur bypass. When you go to Velankanni it is on the right side and offers rooms and fairly good food (the AC section is a bit smelly). It is very near to the big bridge at Tiruvarur (Phone : 04366-251020). 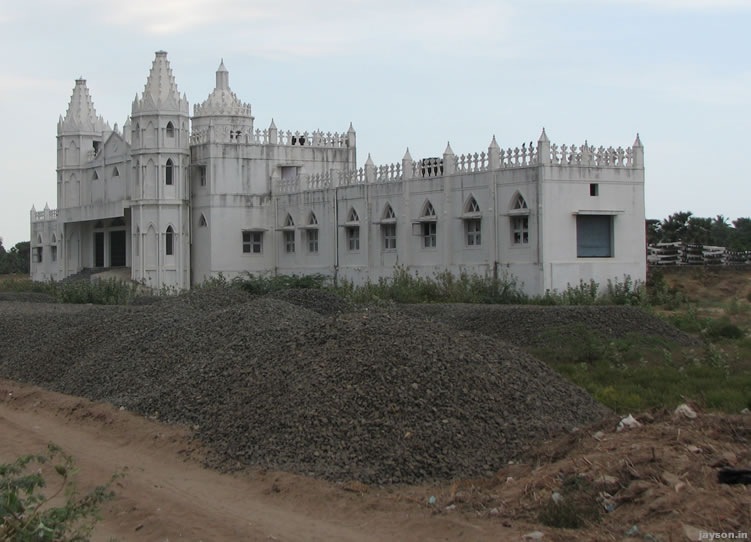 On the way to Velankanni we saw a lot of universities (Sastra University for example), BHEL quarters near Trichy, Tsunami memorial on the Nagapattinam-Velankanni road and rows of houses built for Tsunami victims. Finally we reached Velankanni at about 7:30PM. The road between Velankanni and Nagapattinam is under construction and you should be careful if you reach this stretch during night. I had booked rooms at Hotel Golden Sand and when I reached I was shocked to find that my reservation is not valid. It appears that I booked rooms at the wrong hotel with the same name but located in Nagapattinam. The perils of using online information! We looked for rooms at other hotels and finally we got rooms at Hotel Velanganni which is a bit far from the main church. Room boy brought us dinner and we quickly went to sleep. Next day we started early in the morning and attended the 9AM Malayalam mass at Velankanni church. After that we spent the full day roaming in and around Velankanni church. Trust me, it will take a full day for the Velankanni experience. See below (Places to see) for the must see places in Velankanni. A planned itinerary is recommended to cover all the areas in one day. 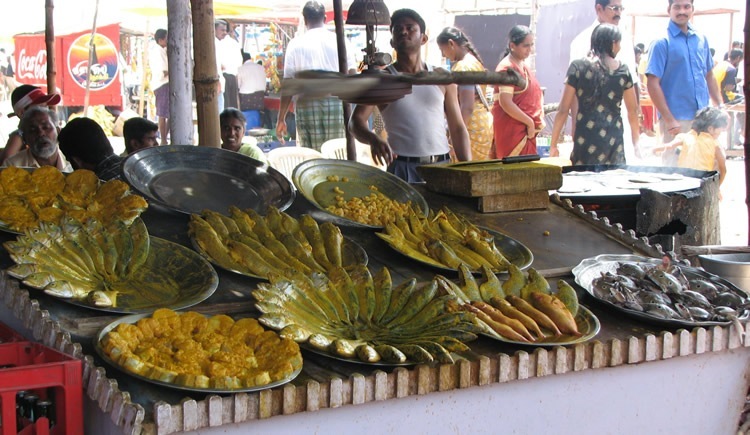 There are a number of restaurants at Velankanni, but don’t expect stellar customer service. We had breakfast at Arya bhavan where it was complete chaos. In the afternoon we had lunch at Hotel Seagate and it was good. 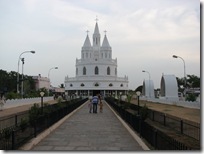 We stayed the night at Velankanni and the next morning we left for Trichy. The train to Trivandrum was at 1PM and we reached well in time. I recommend starting before 7AM from Velankanni since traffic at Trichy stretch can be high. There is a well maintained AC waiting room at Trichy station. You can avail this for Rs. 10 per person for two hours. But they don’t allow you to have food in there. Bus: Regular bus service is available from Trichy and Tanjavur to Velankanni. The local buses can take a while to reach Velankanni and it can be a frying pan experience if you visit Velankanni during summer time. If you are coming with your own bus, there is plenty of parking space inside the church premises. Car/Taxi: Taxis are available from Trichy railway station. Ensure that you fix the rate and all terms before you hire a car. Look for an AC car as the slight increase in fare is worth it. You can check local phone directory for call taxi phone numbers. If you are coming in your own car, ensure that your hotel has enough parking space. Hotel Sea Gate and Golden Sand has plenty of parking space, while some others like Picnic do not. Construction is still in progress in the last stretch of road between Velankanni and Nagapattinam and very careful driving is recommended during night. Air: The nearest airport is Trichy. The nearest international airport is at Chennai. 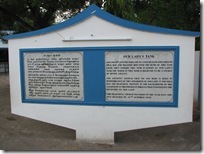 Bank/ATM: There is an SBI ATM which is located prominently in front of the Church complex on the main road. Other ATMS are operated by Union Bank and South Indian Bank. 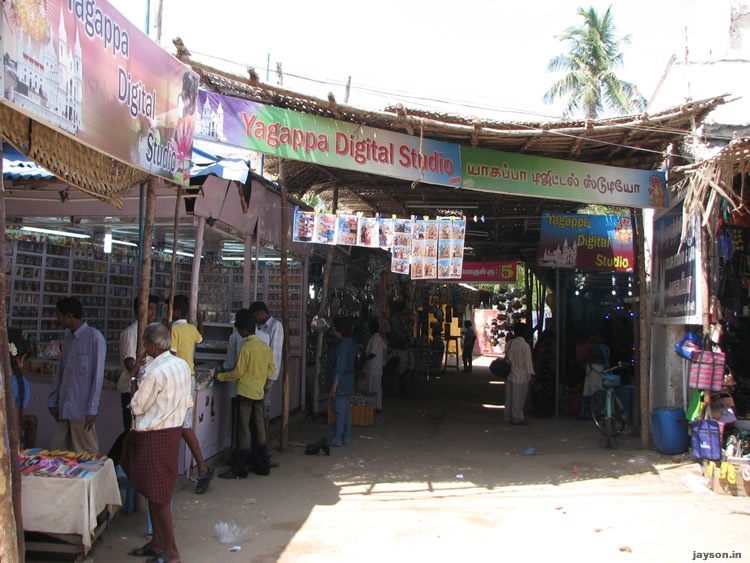 Telephone/Internet: You can find plenty of STD/ISD facilities at Velankanni and almost all mobile operators have service here. Many hotels also provide Internet services inside premises. Sorry, no WiFi here 🙂 The STD code for Velankanni is 04365. The church phone number is 04365-263530. There are about a dozen hotel in and around Velankanni. 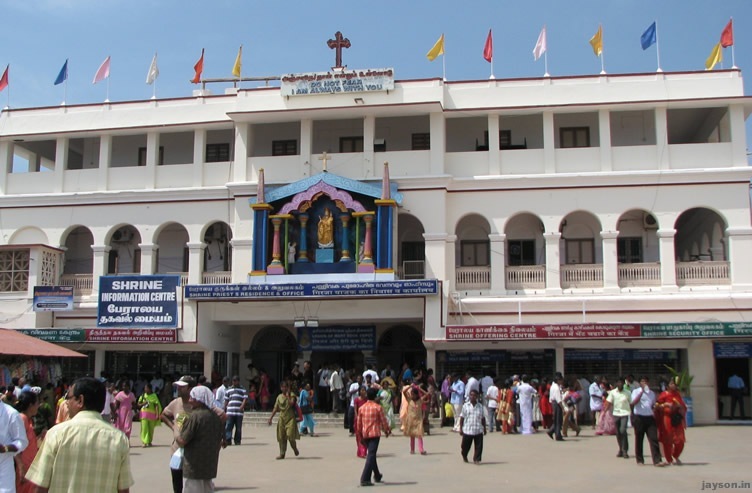 Velankanni church also offers dormitory and room accommodation. But during peak season, you will not get any accommodation unless you book well in advance. The daily rent of hotel rooms vary between Rs. 300 to Rs. 1600. The rent is dependent on its proximity to church and also whether it has AC and power backup. 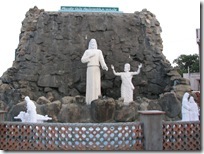 Velankanni is very hot and humid and it is better to book an AC room. Also check in advance whether hotel has power backup. Power cuts are common during summer. 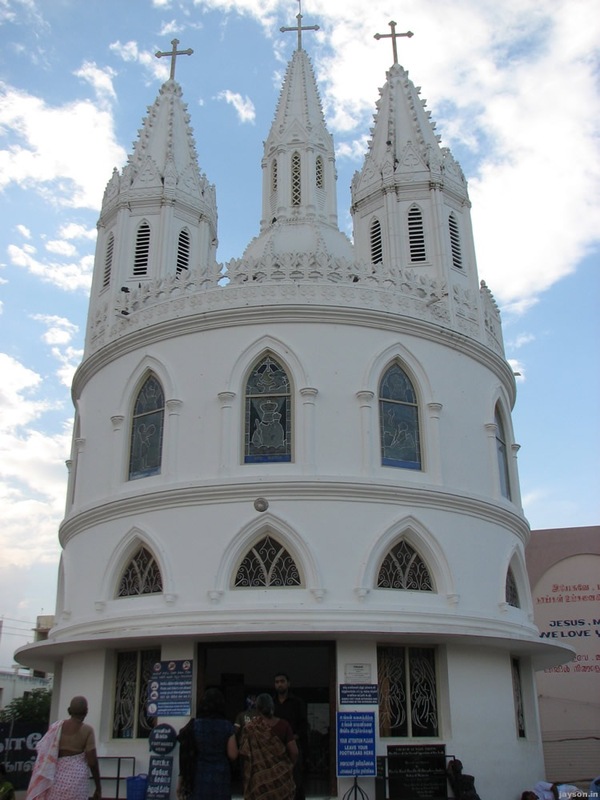 Following are some of the popular hotels in and around Velankanni church. Please note that the phone numbers given may change. Too bad that none of these hotels provide online booking of rooms. If somebody starts a new hotel with an option to book online, I am sure they will get customers throughout the year! The rent for a non AC room is Rs. 500 and it is pretty decent. They also had power backup and cable tv. Interestingly the rear entrance to the church (via Lady’s Tank) is just opposite to this hotel. There is parking space for 4-5 cars in the front. This is the nearest hotel to Velankanni church. This place offers a wide range of hotel rooms costing as much as Rs. 1500. There is also a large parking lot. The front rooms probably gives an excellent view of the Velankanni Basilica. But there is a lot of rush at this hotel and it shows in the customer service. There was board saying AC won’t work during power cuts (I guess there is no power backup). Also the guys at the counter behaved very rudely when I went to check for rooms. 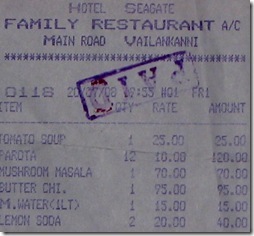 Also beware – there is another hotel in Nagapattinam with the same name (10+ Kilometres from Velankanni). 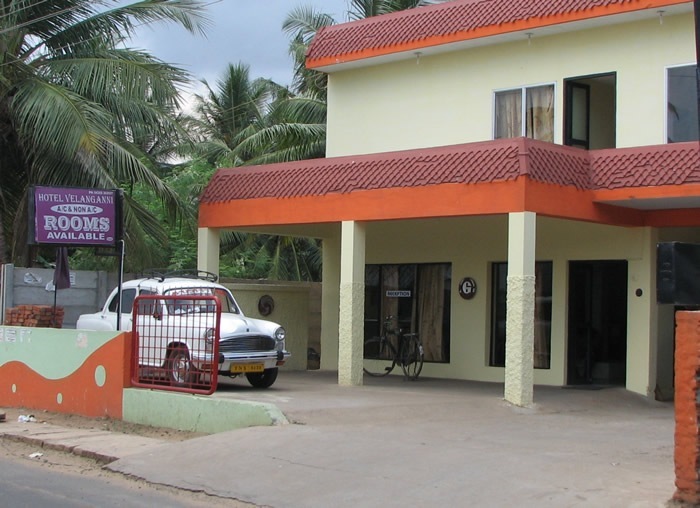 Hotel Sea Gate is located on the main Velankanni road. It is a fairly big hotel with plenty of parking space. The restaurant here is good. There is also an ice cream shop in front of the Hotel. You need to book rooms well advance I guess. A double bed AC room will cost you around Rs.2000. This is another medium range hotel on the main road. This is close to church, but there is hardly any parking space. The AC rooms will cost you around Rs. 1000. Hotel MGM is a good hotel available around Velankanni. It is also quite far from the Church. There is plenty of parking space and is recommended place if you have plenty of money! But forget about walking to Church. Ask the reception to arrange for auto-rickshaws which will cost you Rs. 50 to Rs. 70 depending on the personality of the driver. Food here is ok, but is very expensive and choices are very limited. 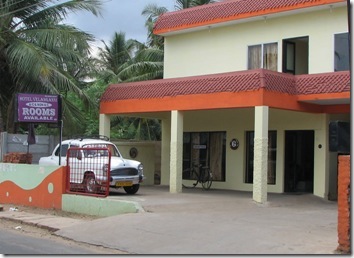 This seems to be the best hotel available in Velankanni and is pretty near to the church. They seem to have a lot of rooms including church facing rooms. The only downside is the cost :-). In 2012, the room rents ranged from Rs. 2500 to Rs. 5000 per day. 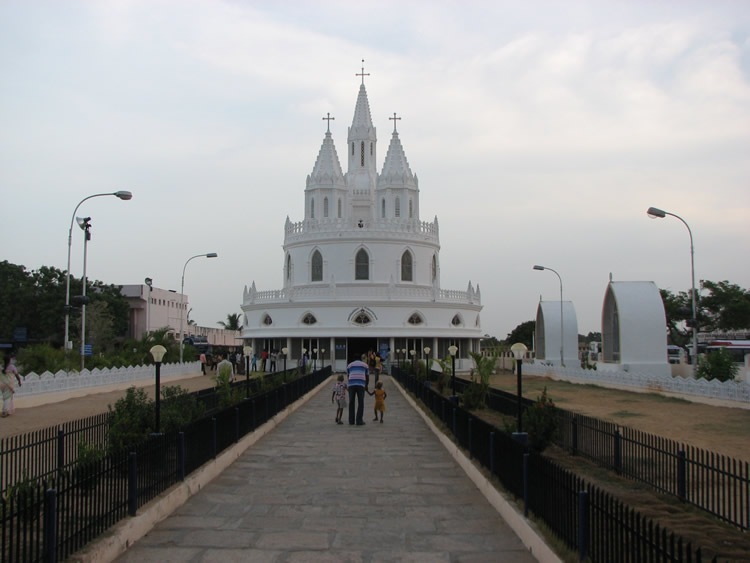 There are many places to visit in Velankanni and I recommend you plan a full day for sightseeing and church visit. Also please note that photography/video is prohibited inside church and other pilgrim centres. 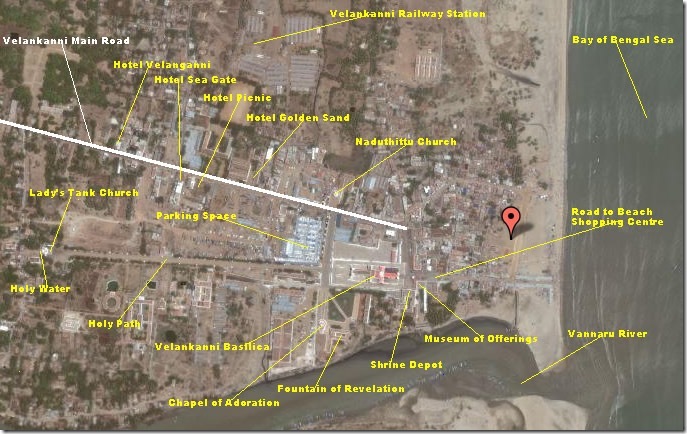 I have prepared the Velankanni site map using Google satellite map. All places of major interest are marked in this. Following is my recommended itinerary for a full day visit of Velankanni church and places around it. I also recommend that you buy a good cowboy hat (available for Rs. 40 in the beach side shops) as the sun here will fry your head! We started from Hotel Velankanni at around 7AM. First we decided to visit the upcoming Velankanni Railway station. 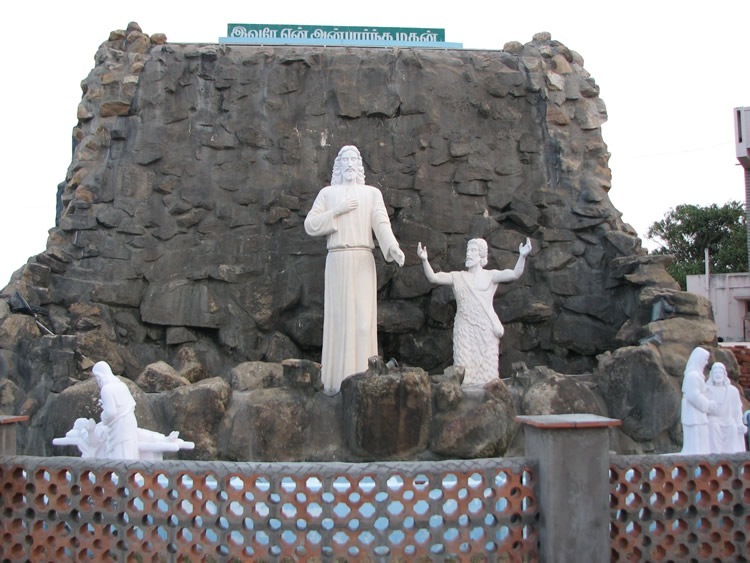 It is about 500 meters from the Velankanni main road and once operational it will be very easy to get to Velankanni. The road to the station is narrow and be ready to face some curious faces! You can see a church (St. Joseph’s) on the way. We then headed to a restaurant on the main road. There are many hotels on the main road but all will be very crowded in the morning. Try to get out of the restaurant as soon as possible since I found it a suffocating experience. After breakfast we went to Naduthittu Church which is on the main road itself. This church is outside the main Basilica complex. According to the legend this where virgin Mary appeared to a crippled boy and healed his legs. The first chapel at the seashore was built after this apparition. This is a place for prayer and there is a beautiful depiction of the apparition inside this. We then went straight to Velankanni Basilica to attend 9AM Malayalam Mass. This was followed by an English Mass. The main Basilica is a architectural beauty and there are two independent churches (one above). In the above church people give Saree as offering and it is put on a statue of Mother Mary. This saree is later given to poor women during their marriage. The old original church is behind basilica towards the seaside. This place is always crowded with pilgrims. Behind the Basilica you will find Museum of offerings where a sample display of items people offer to Virgin Mary is displayed. You can read through people’s experience expressed in various letters written to church. There is also a small bookstall inside this. 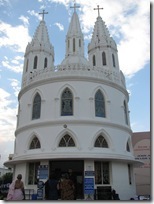 You can buy a detailed guide to Velankanni and also a book on Velankanni from here. Other souvenir items such as key chains and "Jesus Loves You" stickers can be bought from here. There is a "blessed oil counter" and few handicraft shops run by Tsunami affected women on the ground floor. The Shrine depot is located on the right side of museum of offerings. 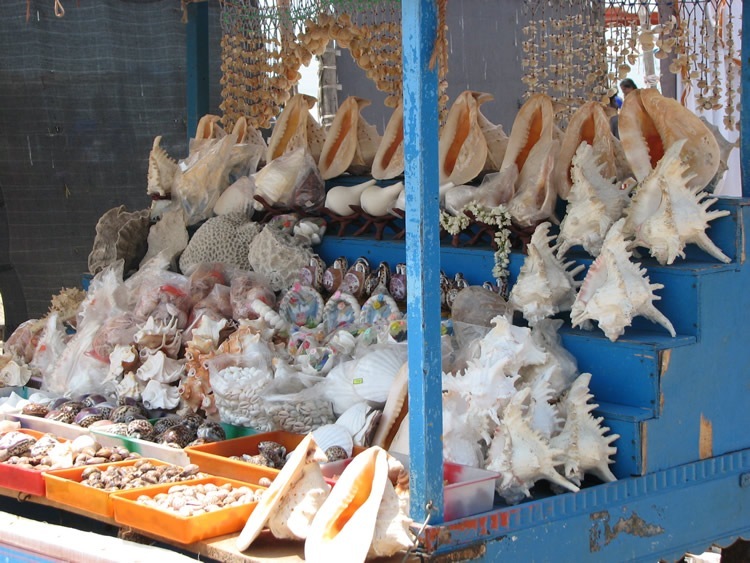 You can buy a lot of stuff including handicrafts and other religious materials. There is an information counter and a security office on the same building. 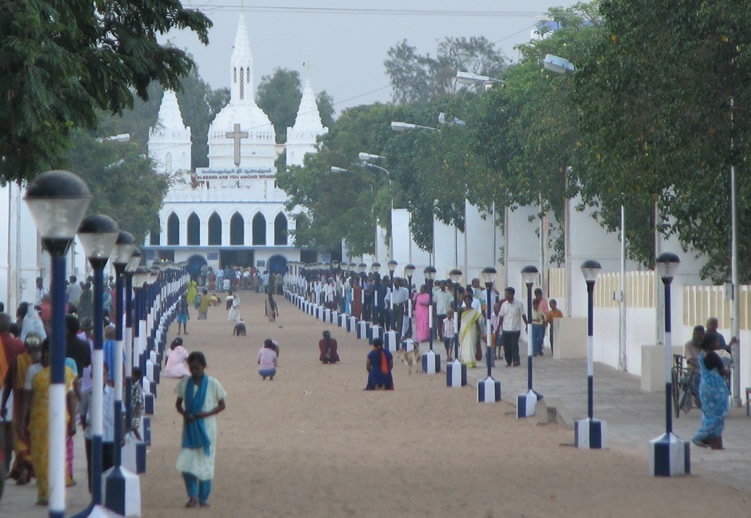 There is a narrow road behind basilica which takes you the Velankanni beach. After the Shrine depot visit we went to the beach. On both sides of the road there are numerous shops ranging from instant photo studios to shops selling pirated DVDs (Don’t even think of buying a DVD as most of them are handy cam copies and is of very low quality). It is an interesting experience and reminds me that all of us love to shop! Check out some of the photos below to get a feeling of what it is like! 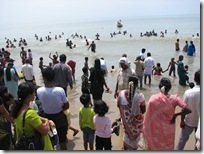 Velankanni beach was hit during the Tsunami and all shops were destroyed. Now there is no trace of Tsunami except for the "Live Tsunami Videos" sold in the new shops! The sea here is rough and deep and swimming here is obviously risky. But you can see hundreds of people swimming in the sea at any time. The sea side is filled with pilgrims in the evening. On the right side of Basilica you will Fountain of Revelation. The fountain here doesn’t seem to be working. Vannaru River meets the Bay of Bengal just on the other side of this fountain. There is also a counselling centre for people with personal problems. Adjacent to Fountain of Revelation is the Church of Adoration. This is a place where you can spend some time in silent prayer. 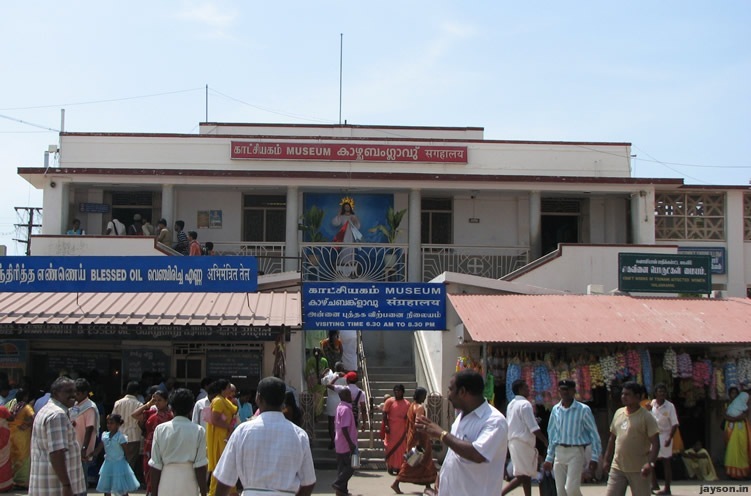 When we went to Velankanni, there was an exhibition on "history of salvation" in the nearby building. Holy path is a sand road which connects Basilica church to Lady’s Tank church. It is also the Way of the Cross. It is around 500 meters or so I guess. You can see devotees crawling on their knees from Basilica to Lady’s Tank Church as an offering. It is a painful way to pray and at the end of it there won’t be any skin left on your knee. At the end of the holy path you will find Lady’s Tank and Lady’s Tank Church. This is where Mother Mary first appeared to a milk boy in 16th century. You can buy holy water from this place. 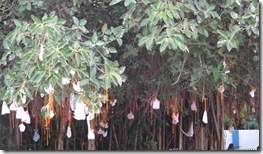 On the left of the church you will see "cloth cradles" hanging from tree branches. Couples tie these "cradles" as an offering to mother Mary asking the gift of a child in return. Many childless couples swear that they got a child after tying the "cradle offering" here – Never underestimate the power of faith. 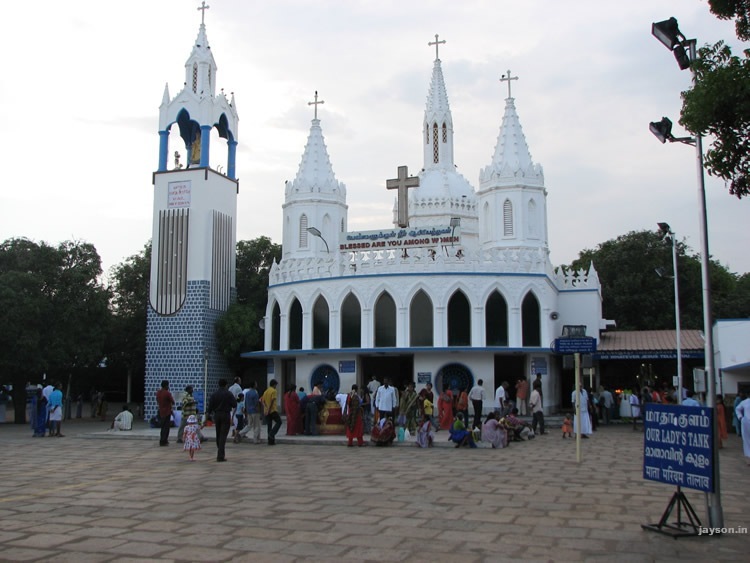 For many Christians, Velankanni gives spiritual inspiration and hope in life. But even if you are not deeply religious(like me – no, I am not an atheist either) Velankanni provides an amazing glimpse of diversity of people and culture in India. Share your experiences at Velankanni church in the comments below. Direct train service is available to both Velankanni and nearby town Nagapattinam. Please see Velankanni by Train for more details. I couldn’t find "Hotel Velanganni"! It seems to have been demolished for constructing something else. A new church named "Morning Star Church" is being constructed on the western side of Basilica. Once constructed it will have a sitting capacity of 15,000! Hotels Picnic & Seagate seems to be under a single group ownership. Please the official site for more details. Official Velankanni Church Website now provides a detailed location map! Finally – another blog post from you after a LONG time. The incident with the tyre almost coming off is too funny and scary at the same time. Old Ambassador cars – sigh. Its been quite some time since I sat in one (last time I came to india, I travelled in a noisy indica). I came to your site searching for the article: “eclipse subversion subclipse installation integration windows” which was actually posted on your site earlier but I couldn’t find it here now. I couldn’t other ways to contact you than commenting here. Hope you don’t mind. You can delete this comment later as its not relevant to your article above. If you don’t mind could you please mail the article to my email id: xxxx. It would be of great help to me as I am looking for some kind of tutorial to help me install subversion server on windows and the clients in another machines to access the repository. Take care. It’s a very good information for someone planning to visit the place. I have tried to reach the hotel Velanganni (which you mentioned as stayed), but it says that the number has been changed. Do you have any other number of the hotel through which I can contact the hotel and book it? Good information… I would like to make a trip to the place too.. You say that the Velankanni railway station will start operating soon…Has it started the service?, as then i could look forward to a direct train from kochi… Could not find the station name on the indian railways site.. Thanks Jayson! Very informative! Planning a visit with my family in December 2010. Please pray I make it to the Shrine at Vailankanni. God Bless You. The narration is very nice. and thank you for your kind heart to share your experience. we wish to visit the shrine soon. Firstly i congratulate you for this fantastic description. your article is very informative. I would like to make a trip to Velamkanni in next week with family. Your information is more valuable to me in this time. Thank you once again. Hai Jaison. Good Work Jaison. Actually I have been to Velankanni from Trivandrum some years back. This vacation also I am planning to visit. I have heard that new Train has started from EKM to Velankanni which is a blessing to pilgrims from Kerala. For people from Tvm Airbus is also a good option. The Roads are pretty wide and well maintained. Finding a good accomodation is the big problem and also the food rates are very high. * Velankanni station has been inaugurated – currently a shuttle train service has been introduced between Nagapattinam and Velankanni – train fare is only Rs 2 – hope to see Express trains from here soon !! God bless you and your family for taking this really great effort. Please add a very recent 4 star hotel called “Clinton Park Inn” Vailankanni. This is the hotel we were expecting for a long time. My whole family including my elderly parents and 5 and 10 year old kids were safe,secure, the best sanitated, clean, hygienic food and the best service and hospitality I have ever seen in my life ! I recommend this clinton park inn as the ultimate place for all those who would like to have the right place to stay with their family. I was just going through the history of Vellankani when I came across this site. Well me and my family got back from our first trip to Vellankani on 18/04/2011 and I must say it really was a very spiritual experience. the churches have gone through many expansions and it truelly is a sight to see. The devotion of the people erespective of their caste, creed and even religion is amazing. We stayed at MGM which I think is the best hotel in that area ( Although the range of the food is not that great….). The best solution if you are planning on going is to go though a travel agent like we did. Vereything will be very well organised with transport, best hotels and site seeing …etc. Just a note .. Dont drink their normal water. buy/take enough bottled water! I would like to thank you for posting your experience in detail. It seems that the Velankanni church offers dormitory and room accommodation. What should I do to book a room there? Would you pls. help me? Thanks for your post, it is really helpful for travallers.. I was looking to book a hotel at velankanni and i reached your page. A very informative one. I booked the room at MGM ( phone no i got from your page.) Leaving tomorow morning by car from trivandrum. Will pray for you. Wow ! So nicely written.I am in a hotel in Chennai actually on my way to Velankani and after reading this gentleman’s report,i felt i was there walking along side him.Thanks for the great report ! I have a question. Please any one give me answer. When we go to velankanni we ask for a favour. We also say that if it is granted we will give thanks offering. Then when our favour is granted and if we dont repay thanks offering is it a sin? what happens to us? Good Job Jason! i am planning to go to velankanni on 26th dec and return on 29th dec (2011) well i getting a direct train from margao(goa) to vlkn but however not a return train on time could u suggest to me a diverting train route from a nearby station where i may get a train back to margao (GOA)… reply ASAP! Thanks! Firstafall lot of thanks for the photoes.This will give lot of knowledge of somany viewers about our lady of health velankanni.May be some people are not visit velankanni yet, this detailes give full inspiration on the viewer those who visit this site.May god bless all the viewers. virtually a mini travel guide . authoritative and informative. excellent description. for info : the Railway Station was officially opened on 2Oth April 2011. Every Saturday morning there’s Mass and devotions (in Tamil) at Our Lady’s Pond. At the back of the Pond one can get Holy Water,but buy the empty bottles on the right hand side of the Chapel. At the back of the Holy Water collection area there are a lot of stalls selling hot local Breakfast items, a la’ minute. To avoid the congestion there is an alternative back route to return to the main street. Walking time about 10 minutes. Its better to make prior arrangements with the Auto guys. Negotiated rates should not exceed Rs 30/- , advisable to take down his contact number for regular use durng your sojourn in Velankanni.May our Lady of Good Health Bless you all. place at the church how do i contact them???? They do have cheap accommodation arranged by church. However you need to book the room going to the booking counter near the church.